No matter if you have a spacious, luxurious bathroom or a quaint, compact one, your choice of bathroom vanity is very important. It’s a major piece of bathroom hardware, and its features and aesthetics will help control both how you use your room and how it feels to be in it. Vanities come in a wide variety of shapes and styles, all with their own pros and cons. Bertone Woodworking can help you find the custom vanity that best fits your needs. Here are some of the most common types of vanity, as well as how they can help or hurt your bathroom. The most common type of vanity, cabinet-style pieces are good all-purpose pieces of furniture. While they take up the most space, you get the benefit of built-in drawers and concealed compartments, maximizing your storage potential. These can either sit flat on the floor, or come with legs for a more open design. Our woodworkers can help craft one to fit your measurements, keeping it from overpowering the room and squeezing it into the space you have available. A freestanding sink gives your bathroom a sense of visual relief – and the benefit of extra legroom and space to move around in, making it a great choice for smaller rooms. You do end up sacrificing storage, though that can be alleviated by your other design choices (i.e. medicine cabinets, decorative shelves or baskets and so forth). So if storage is less of a priority for you – or if you have alternatives elsewhere in your room – a standalone pedestal or console sink could be exactly what you need. If you’re concerned about the footprint of your bathroom furniture, a wall-mounted vanity might be exactly what you need. Mounted solely on the wall, these vanities keep open space beneath the sink to the floor, lending an open, airy feel to your room. Storage varies based on design and your needs, and can be customized to meet your requirements. Bathroom vanities are an integral part of any bathroom design and it’s essential that you make a good choice when having yours replaced. Contributing to the room in both an aesthetic and a practical sense, they are heavily utilized on a day to day basis. There are many styles and types of vanities that Markham and Scarborough homeowners can purchase nowadays, making the choice even harder, which is why we’re going to offer you a helping hand by listing some of the most common mistakes made when going through this process. Not Considering Design Flow – What do we mean by design flow? 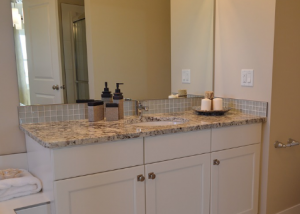 Well, ideally Bathroom Vanities Markham should slot perfectly into the rest of the room’s design, complementing and enhancing other elements that have been used. During bathroom renovations, many homeowners make the mistake of picking each element individually and end up with a disjointed design where the bathroom vanity sticks out like a sore thumb. Opting for the Cheap Option – Bathroom Vanities Markham are available at a wide range of different price points, but this is not a feature that we would advise you to skimp on. Heavily relied upon and forced to endure difficult conditions (high moisture levels and heat), bathroom vanities made from lower grade materials don’t last long and their appearance will start to deteriorate relatively quickly. Remember that the bathroom can have a significant impact upon the market value of your property! Choosing Form Over Function – Bathroom vanities must strike the right balance between form and function in order to “work” but many times the former gets far more attention than the latter during the selection process. Remember that many different items are typically stored in bathroom cabinets and if the storage facilities of your cabinets aren’t sufficient, your bathroom might turn into a very chaotic environment – not what you want to see first thing in the morning! Not Getting Your Measurements Right – It doesn’t matter if you find the perfect bathroom vanity for your home, if it doesn’t fit into the space you have available, it will be useless. Make sure you take accurate measurements before you start looking at vanities to avoid disappointment. Need help selecting a bathroom vanity for your home? Look no further than Bertone Woodworking, who have been serving the communities of Markham and Scarborough for many years. 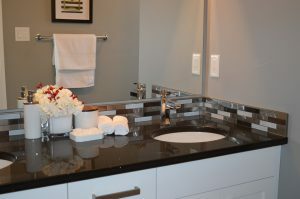 The Different Styles of Bathroom Vanities: Which Should You Choose for your bathroom in Markham, Pickering & Scarborough? Are you considering remodelling your existing bathroom? One of the most popular additions to any modern bathroom is a vanity. Basically, a bathroom vanity is made up of a sink surrounded by storage furniture which adds a touch of elegance to the room whilst also making it more practical in terms of storage capability. There are a number of options and variations available to you if you are considering adding a vanity. Thankfully there are lots of specialist companies in the Markham and Scarborough area, including Bertone Woodworking, that can offer you assistance and answer any questions that you may have. It is advisable to choose a style that complements your current home and is practical for all the family. With this in mind, why not indulge your creative side and consider contacting a custom cabinetry specialist? Bathroom vanities have many benefits which is why they have become so popular. You should assess which benefits are most important and make a decision as to which style of vanity is most suitable. Bathroom vanities are available in a number of materials and styles. You should understand the advantages of each material and style before selecting you new bathroom vanity. A lot depends on the size of your bathroom, particularly in terms of choosing between single and double units. Outlined below are some of the most popular designs. Wooden Vanities Provide Traditional Elegance – Vanities that are made from wood lend themselves to a more traditional look. However, some contemporary designs also benefit from using wood. Oak, cedar and teak vanities are generally classical in design and are extremely strong and durable which is important. Custom cabinetry specialists can produce wooden vanities to match your exact requirements. Why Not Consider a Contemporary Glass Design? – Glass vanities are becoming more popular as people look to make their bathrooms different from the normal styles. Glass can provide a stunning luxurious look and can also be mounted on walls. However, care must be taken to ensure that young children don’t have an accident as glass can be fragile. Many glass vanities are accompanied by chrome or metal framework which adds a modern look. Double Vanities Provide Extra Storage Space – If your bathroom is relatively large in size then a double vanity may be the best choice. A double vanity will typically consist of two storage cabinets either side of the sink, with impressive table tops and another storage cabinet or set of drawers below the sink. This type of vanity is perfect if you require extra storage space. Double bathroom vanities can also be combined with large, impressive mirrors. Space at a Premium? A Single Vanity Is For You – Single vanities are ideal if you only have a small bathroom. They are neat and compact which maximizes the space in your room, but also adds an elegant look and provides adequate storage space. Bertone Woodworking specializes in custom bathroom vanities. Call us on 416-876-5144 for an informal chat.